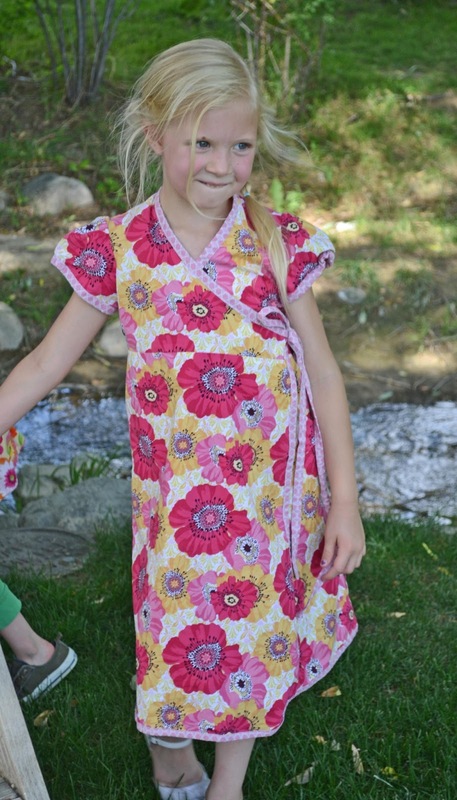 Paisley Roots: Candy Castle Bubblegum Dress Review and Give-away! Candy Castle Bubblegum Dress Review and Give-away! 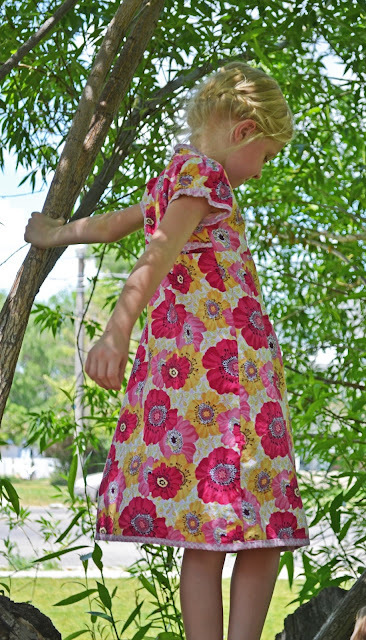 This month I am taking the "Ultimate Blog Challenge" and to kick it off I am reviewing the Bubblegum Dress by Candy Castle Patterns and giving you the chance to win the pattern yourself! Candy Castle Patterns is a really new designer. They just released 2 patterns last month and are working on a third right now (which I have every finger, toe, arm and leg crossed to test!). 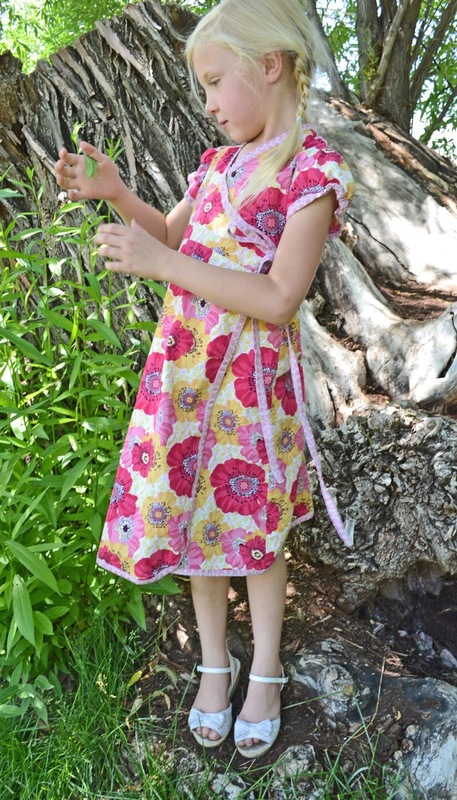 Now, I don't know about you, but I've made all the summer clothes that could possibly fit in my kids wardrobe and have started looking for patterns for the upcoming school year. And with school, comes a dress code. SIGH - When my eyes fell on this dress I was drawn like a moth to the light. This is one that easily fits into all of dress-code criteria. And honestly, I love the kimono cross-over thing going on. I really could not wait for it to come out! Did I mention that the sizing is from 6 months to 12 years! You read that correctly, 12 years! With a 6 year old that is outgrowing size 8, my options have been growing slim. So I was ecstatic that this pattern will still last us some good years! Printing was great. It's 24 pages, but the pattern aligned perfectly. The tutorial was amazing with step by step instructions and pictures, so the dress came together SUPER easy. The part that took the longest was making all that bias tape, and you can buy that pre-made at any Walmart or craft store. You also have the options for a few different variations. I chose not to do a ruffle, but if you want to see a version with it you can look at That's Sew Kari's review. Her's is stunning! You can also check out Candy Castle Patterns Facebook page to see a few different versions too. I feel like I'm missing something in this post.......OH! That's right! The reason you are actually here reading all my stuff. Cause lets be honest, you were hooked with the first picture! Enter the raffle-copter below for your chance to win this pattern yourself! Or if you are like me and couldn't wait, grab your copy here: Bubblegum Dress. Be sure to check out her other pattern the Jelly Bean Skirt too and keep your eyes open for more greatness to come from this designer! very cute! looks comfortable and playable. fingers crossed! Thanks for the giveaway Karly! Looks like a very comfortable and versatile pattern.